Publisher: George Routledge & Co. Country: United Kingdom. Date: c. 1859. 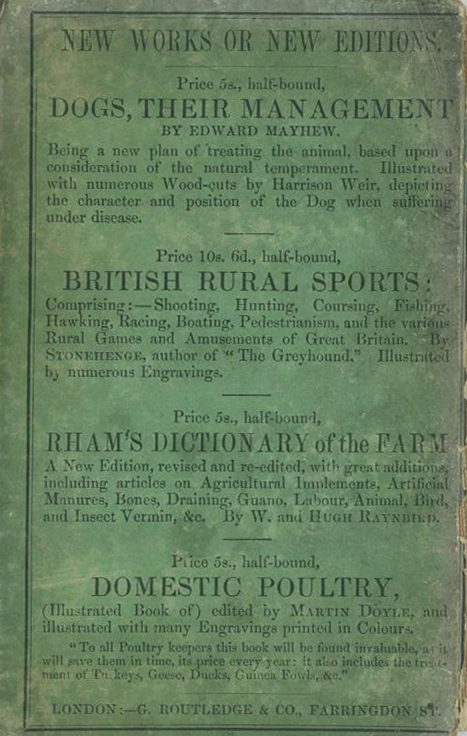 London: George Routledge & Co., 1858 (Routledge's Cheap Series). Hardback with paper covered boards. No dust wrapper. 63 pages. No illustrations. 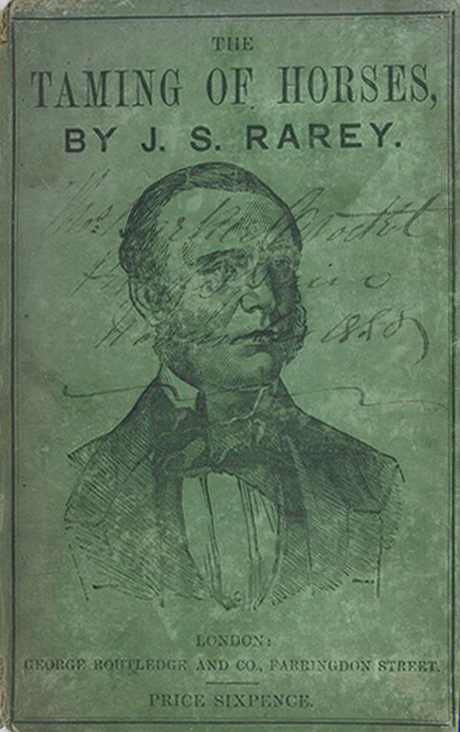 Reprinted from original American edition of 1856. Series Note: "This valuable Series now contains upward of 170 volumes. They form a complete library of instructive, useful and entertaining knowledge. Each work is sold separately, at prices varying from One to Two Shillings, and many of them are illustrated. They are admirably adapted for all Mechanics' Institutes, Soldiers' and Sailors' Libraries, or Village Book Clubs, and for all kinds of popular instruction. They embrace the Works of our best authors in the various departments of Biography, History, Fiction, &c.; and Books that formerly cost pounds may now be obtained for shillings. No family ought to be without this Library, as it furnished the readiest resources for that education which ought to accompany or succeed that of the boarding-school or academy, and it is infinitely more conducive than either to the cultivation of the intellect and the well-being of society." Publisher's advertisement in Forest life in Norway and Sweden: being extracts from the Journal of a Fisherman by The Rev. Henry Newland (1795-1862), Rector and Vicar of Westbourne, author of The Erne: its legends and its fly-fishing, etc. (London: George Routledge & Co., 1859). 5. Life of Nelson - James Allen. 6. Life of Wellington - Charles MacFarlane. 10. Vicar of Wakefield and Poems - Oliver Goldsmith. 12. Sir Robert Peel: His Life and Times. 13. The Arctic Regions - P. L. Simmonds. 19. India - J. H. Stocqueler. With illustrations. 21. The Fall of Palmyra - Rev. William Ware. 22. Rome and the Early Christians - W. Ware. 23. Gold Colonies of Australia - G. B. Earp. 24. New Zealand - G. B. Earp. 34. Two Years Before the Mast - Dana. 35. Representative Men - R. W. Emerson. 38. Monk and Washington - Guizot. 42. Oliver Goldsmith's Life - Washington Irving. 44. Lives of the Successors of Mahomet - Washington Irving. 46. Nelson on Infidelity - Rev. G. A. Rogers, ed. 47. Russia As It Is - J. R. Morell. 50. Turkey: Past and Present - J. R. Morell. 60. The City of the Sultan - Miss Pardue. 63. Hochelaga - Eliot Warburton, ed. 65. Sunny Memoirs of Foreign Lands - Mrs. Stowe. 70. Shilling Cookery for the People - A. Soyer. 71, 72. The History of the Reign of Ferdinand and Isabella - W. H. Prescott. 2 volumes. 82, 83. History of the Conquest of Mexico - W. H. Prescott. 2 volumes. 85, 86. History of the Conquest of Peru - W. H. Prescott. 2 volumes. 92. Burmah and the Burmans - K. H. R. Mackenzie. 95. The War; or, Voices from the Ranks. 96. The Pleasures, Objects, and Advantages of Literature - Rev. W. A. Willmott. 97. Biographical and Critical Essays - W. H. Prescott. 98. Educational Lectures delivered at St. Martin's Hall. 100. Turkey - The Roving Englishman. 101. Transatlantic Wanderings - Captain Oldmixon. 104. The Crimes and Odessa - C. W. Koch. 109. America and the Americans - W. E. Baxter, Esq. 116. My Brother's Keeper - Miss Wetherell. 120. Sebastopol: The Story of the Fall - G. R. Emerson. 122. Robinson Crusoe - Daniel Defoe. 130. History of Philip the Second of Spain - W. Prescott. Vol. 1. 131. History of Philip the Second of Spain - W. Prescott. Vol. 2. 146. English Traits - Emerson. 160. Charles the Fifth - Robertson and Prescott. Vol. 1. 161. Charles the Fifth - Robertson and Prescott. Vol. 2. 169. The Mutiny in India - A former Editor of "The Delhi Gazette". 170. Parthenia; or, The Last Days of Paganism - R. B. Lee. 173. Robert Burns and Sir Walter Scott: Two Lives - Rev. James White. 174. The Royal Princesses of England - Mrs. Matthew Hall. Publisher's advertisement in Forest life in Norway and Sweden: being extracts from the Journal of a Fisherman by The Rev. Henry Newland, Rector and Vicar of Westbourne, author of The Erne: its legends and its fly-fishing, etc. (London: George Routledge & Co., 1859).